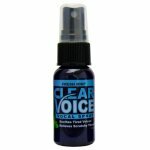 Home > Accessories > Clear Voice Vocal Spray - 1 oz. 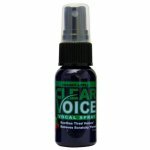 Clear Voice Vocal Spray - 1 oz. All types of performers have relied on Clear Voice strawberry lemonade natural vocal throat spray because of its ability to allow them to perform at a high level night after night. All you have to do is spray the product into the back of your throat before your next performance and you’ll hear the difference.